This memorial consists of two plaques, one on the front wall of No. 27 Worthing Road and the other on the front wall of No. 9 Spencer Road, both in Southsea. SIX WERE CAPTURED AND EXECUTED. 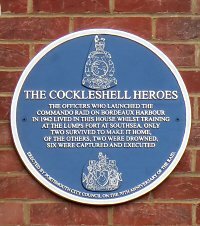 These plaques were erected by Portsmouth City Council in October 2012, the 70th Anniversary of the raid. When WW2 began No. 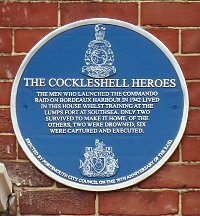 27 Worthing Road was the home of Mrs Leonora Powell whose husband was a member of the Royal Marines. At that time No. 27 was run as a Guest House called "White Heather", probably named after the Powell's daughter Heather who was 16 years old when the marines were billeted with them. Heather idolised her father and took it upon herself to look after the men in a way she hoped someone else may find themselves looking after him. Heather developed a particular fondness for Robert Ewart and they formed a close relationship in the time they were together. Ewart lost his life in the raid which so distressed Heather that she died shortly after.